If you have ever climbed in the Himalaya, ambulance you probably are as shocked by this headline as I was to receive the news. Lama Geshe suffered a stroke around September 20, 2010. He was flown to Kathmandu, paralyzed and in poor condition. He has since undergone an initial surgery and seems to have improved some. He is now responsive and resting. Lama Geshe, 79, lives in the Nepalese village of Pangboche with his wife and family. He is the highest ranking Buddhist Lama in the area. Almost every climber to the Everest region visits him to receive a blessing before their climb. For many climbers and trekkers, this is one of the highlights and life long memory of their visit to Nepal. If you do not know Lama Geshe then this is what makes him so special – his smile, his gentle touch, his soft laugh, his aura that made you feel as if the world was in good hands. You simply feel better no matter your woes by just being near him. The ceremony is very detailed. First he takes a thin yellow or red string (a sungdi) and places it around our neck. Then we give the silk scarf (a kata) to his daughter with an offering in it. He says a brief prayer and the scarf is placed back around our neck. For many, he offers a gentle head bump to “seal the deal”. We move to the bench and sit quietly while he does the same ceremony with all the other climbers and Sherpa. The Lama then begins to chant prayers for our safety and permission to climb the mountain while tossing rice into the air and occasionally ringing a small bell. The entire ceremony last about 20 minutes. Today he must have blessed over 100 climbers and Sherpa. I am always touched by this ceremony. In the quiet moments, I reflect on why I am here and what this means to me. The family has established a fund to help Lama Geshe. Please use the secure “Donate” button below to make a one time donation that is fast and secure. This will take you to PayPal’s safe and secure web site to enter your personal information. Your donation will be sent directly to Lama Geshe’s son Jigme Sherpa who will serve as Director of the fund. 100% of donations will be utilized to benefit Lama Geshe and his family. Jigme is currently a Junior at Nazareth College. He has taken an emergency leave this semester and is en-route to Kathmandu to care for his Father. Update October 3, 2010: This is from Jigme, Lam Geshe’s son. My father is doing pretty well. I met the doctors yesterday and they told me that he had suffered Chronic Subdural Haematoma. Before admitting to the hospital he was motionless and could not talk.The doctors said that it was due to excessive amount of blood in the brain which pushed and squished the right side of the brain. My entire family believed he would not survive but now things are in control. Lama Geshe has been discharged from the hospital and is living in a rented apartment in Bouddha. He will most likely be in KTM for couple of months. The stitch on his head is taken out and he has started doing physical therapy. My heart is heavy as I make my way to Kathmandu. Those who know us and know him, know how dear he is to us. This years expedition will be very different. We are all praying for a possitive turn around in his health. Thanks Alan. I’m still wearing a very faded and worn sungdi that he tied around my neck in 2007. Thanks for sharing Alan – for many of us, your postings are the single most direct way one can “see” the other side of the world and learn more about the culture, people, and mountains. I hope Lama Geshe recovers from this turn of events. Lama Geshe has been a friend of climbers for many, many years. We are all praying for him, as he has done for us. Sad news Alan..had blessings from him over the years. 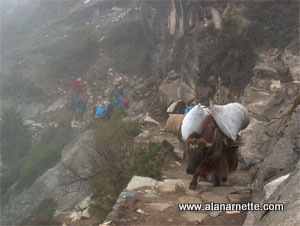 I was in Pangboche about 4 months ago on my way down from EBC and spent one night there but was not aware of the Lama’s presence. I am sorry to hear about his condition and pray that he will soon recover. Thanks for posting this Alan.